One less thing to worry about! Fenced playgrounds provide so much more peace of mind for parents, knowing your cheeky and adventurous sprouts can’t wander off onto roads and wind up in all sorts of trouble. Here are some of the best-loved fenced-off playgrounds in every corner of Sydney, that your child won’t even want to escape from! Chelsea Street Playground - This Redfern playground is small but full of community spirit and was recently re-designed with help from kids at the local primary school. Cook and Phillip Park Playground - Finally something for older children! In the city’s centre is this fenced park, suitable for kids 5 years and up. Eddie Ward Park Playground - There are 2 playgrounds here with the fenced one for toddlers located away from the road. The older kids park, though unfenced, has a skate bowl! Bieler Reserve Playground - This gem in Randwick is fully enclosed, not too big and not too small. It has kiddie-friendly equipment ideal for younger tots, and its giant climbing spider’s web will definitely appeal to the older kids. It's only a short walk to local cafes and shops for a much-needed coffee fix. Bondi Beach Playground - How could you go past those views or that location? Bondi Beach Playground has an awesome shaded sandpit and is most suitable for children aged 0-4 years. Read more about it here. Queens Park Playground - Located on Darley Road, this playground is nestled among endless green parklands. It has rubber flooring on the ground and loads of equipment including swings, a shaded sandpit and a sit-on sand digger. Read more about it here. Bangor Park Playground - Word must’ve got out about this Coogee playground because despite it’s non-central location, it always seems to be busy! It’s fully fenced off, has shady tarps overhead, spongy flooring, cool slides and a dog-park surrounding it. L’Estrange Park Mascot - With PLENTY of room to move and a spongy floor for children to run around, L'Estrange Park Mascot is the place to be. There are 2 sides to the playground, one being age appropriate for up to 6-year-olds, the other for up to 12-year-olds. You’ll find a sand pit, water play items, bike track with road signs, climbing webs, slides, jungle gyms and more! The Entertainment Quarter Moore Park - With 2 outdoor playgrounds catering to under 6s and kids aged 6-12, EQ in Moore Park is the ideal place for the kids to blow off some energy. Both parks are fenced off and keep the rays away thanks to shade sails. Plenty of seating is available for parents to take a load off. Dee Why Beach Playground - With shady tarpaulins, heaps of seating, proximity to a rock pool and gorgeous beach views, make the most of the sunshine and hours of play at Dee Why Beach Playground. Collaroy Beach Playground - Sometimes you just can’t go past a fresh ocean breeze! 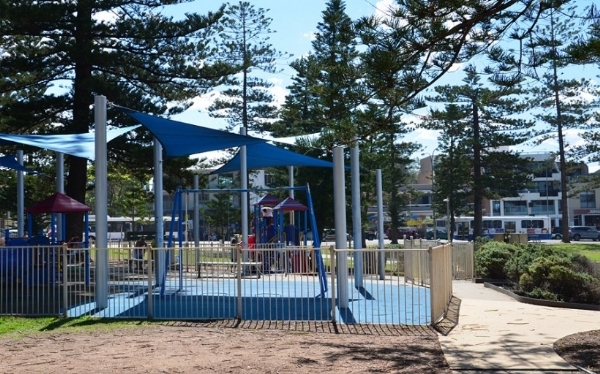 Collaroy Park is in perfect proximity to the water, has excellent views, surrounding cafes and some seriously cool play equipment. If you love this one, try the Balmoral Beach playground at the Esplanade, Little Manly Point Playground, or Manly’s Lagoon Park Playground. Passmore Reserve Playground - In Manly Vale, this one’s enclosed due to the nearby lagoon. It’s an old-school wooden playground structure with a natural bush vibe. Wahroonga Park playground - This park was renovated back in September 2014 and remains in great shape. There's equipment for little kids including mini trains, toddler swings, slides and springers as well as entertainment for the older kid's including a flying fox, a moving roundabout, a half-sunken pirate ship and lots more. 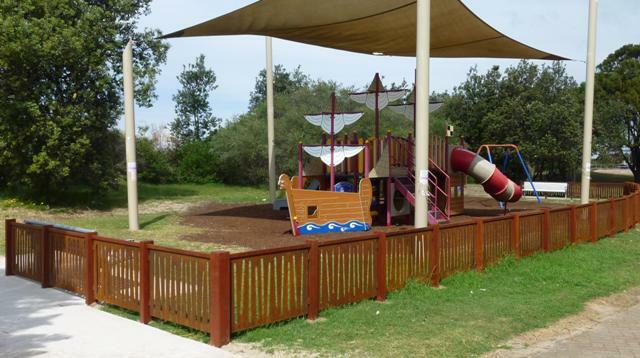 Livvi’s Place - Located in Timbrell Park, Five Dock, this is a genuinely spectacular park. It’s got a powered roundabout, nets to climb, slides (with wheelchair accessible ramps) and so much more. This park was recently renovated, so enjoy it while it's pristine. Burwood Park Playground - It may not have brand new equipment, but kids won’t care! It has a beloved flying fox, swings, spring rockers and a wobbly-walker. 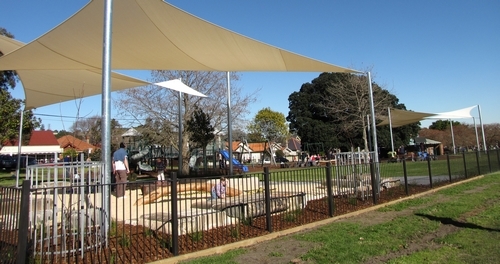 Camperdown Memorial Rest Playground - There’s something for all ages at Camperdown Memorial Rest Playground. The sandpits, wobbly bridge, and bushy feel give this park a very natural, earthy vibe. Brays Bay Reserve in Rhodes - In a fantastic picnic spot, Brays Bay Reserve has a fully fenced playground for the little ones and an open one for older kids with a spider’s climbing web. Bring your golf clubs to use on the mini putt-putt area too! 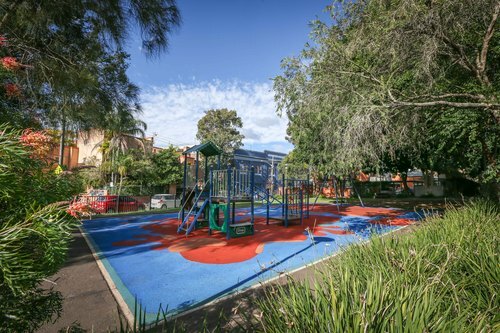 Robyn Kemmis Reserve - A medium-sized fenced playground on Franklyn Street, Glebe suitable for all ages. Expect a tranquil pocket park with grassy lawns, plenty of greenery and a BBQ. Doyle Ground - This north Parramatta gem is on a 7.6-hectare sports-ground and is completely enclosed. A simple playground that gets the job done! Larry Bolitho Reserve - A medium-sized, fully fenced playground with a bird's nest swing, rope walls, a merry-go-round and synthetic grass covering the floor. River Park - Welcome to the only fully fenced playground by Parramatta River in Ermington. It's best suited for children aged 5 years and under and has equipment including swings, a see-saw, a cubby house, spider web wall, and boat-shaped climbing structure. North Rocks Park - Located in Carlingford, this playground is shady with lots of equipment, a rope net to climb, mini rock-climbing walls, a wobbly bridge, and lots more. Caroline Chisolm Park - In Winston Hills, this fenced playground is perfect for tiny ones with slides built into the ground, a bird's nest swing, fun mirrors, balance beams and plenty more. It's surrounded by larger parklands with tennis courts for older families too. Bernie Mullane Reserve - Kellyville’s fully enclosed playground ticks all the boxes - it has shade, a wheelchair accessible swing, all kinds of equipment and nearby amenities (and coffee!). Wollundry Park - Located in Pennant Hills, this quaint park is near the train line, has soft ground, and its overarching gum trees are full of cockatoos. Mums can watch on from the picnic shelters. Livvi’s Place - Everyone's favourite playground in Yamble Reserve is sure to be a hit with your kids. The colours, the architecture, the game playing, the climbing, the fun - you can see why it's one of the most popular playgrounds in Sydney! Beecroft Train Playground - Next to Beecroft Train Station, this one has recently been revamped. Tots and toddlers, in particular, will love this train-shaped, padded playground, with a train-spotting wall for children to ogle passing trains! There are great coffee shops nearby too. Mount Annan Botanic Gardens Playground - Nestled in a gorgeous location, little ones will love the sandpit with mini buckets on pulleys, and of course, the flying fox. You can explore the fantastic grounds after you play. Kyeemagh Beach Playground - Located in Brighton Le Sands, this bright-yellow enclosed playground is near the beach and has loads of fun equipment to enjoy. Carrs Park - This newly renovated playground has plenty of space to run, BBQs, and is located away from the main road. Cook Park Playground - Although a relatively small playground, Cook Park Playground has a quirky nautical theme and is a great spot for newly tottering tots. Shelly Beach Playground - In Cronulla, you’ll find sea views and equipment for younger and older children to swing, slide and climb. There’s a liberty swing for disabled children too. Hint: Search your local council website for a full list of local, enclosed parks in your area. Is your favourite not on our list? We want to hear about it! Comment below. Thanks for this list of playgrounds.There is one in Glebe,its a beautiful park,with lots of play area for kids and also picnic spots if you want to celebrate birthdays.I would recommend that.Hope you can add it to your list.It is just opposite the broadway shopping centre. Thanks so much Kim for this valuable feedback. We will remove this from our list. I would certainly give Rouse Hill Regional Park a miss at the moment, it's extreamly run down with lots of broken activities, it's actually quite dangerous to small children, there are huge holes in the softfall making it very easy to trip the flying fox has also been closed. Thanks Kellie. We haven't explored these ones yet but they sound great. Thanks so much for the recommendations.